The Hacienda La Magdalena dates back to the 17th century and is today a stylish boutique spa hotel with exquisite event space. With its splendid gardens and facilities, weary travelers are invited to relax, rejuvenate, and reconnect with nature. The fountains and brooks dotting the grand wooded area with ancestral willows is a divine respite from the hustle and bustle of a busy city life. The hotel features eight guestrooms with bath and balcony, ten suites with Jacuzzis, and two presidential suites, each individually and elegantly decorated for serenity and a peaceful night’s rest. Amenities include complimentary WiFi, iPod docks, flat-screen televisions with cable programming, DVD players, and an in-room safe. Guests can bask under the sun by the pool or book a therapeutic spa treatment or massage. There is an on-site restaurant and bar, game room, business center, and event space for romantic weddings or playful celebrations. 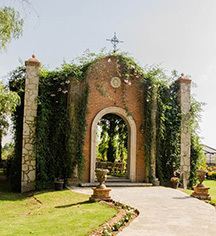 Hacienda La Magdalena is only 15 minutes from the center of Zapopan and 45 minutes from Guadalajara. The hotel has had the privilege of hosting celebrities and dignitaries from the realms of art, politics, and business. It has achieved the designations of Distintivo H, M, C, and belongs to the following notable associations: Tesoros de México, Haciendas y Casas Rurales de Jalisco, and Ruta del Tequila. 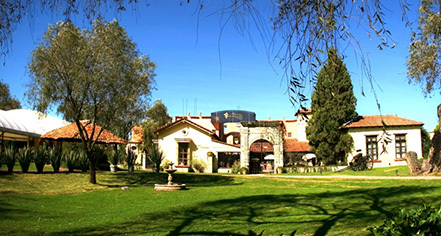 Hacienda La Magdelena, a member of Historic Hotels Worldwide since 2016, dates back to 1735. The hacienda had a factory called “La Escoba” on the estate, which was a spinning and weaving mill for cotton fabrics and it was the first to manufacture this fiber in Western Mexico. The Hacienda La Magdalena dates back to the 17th century and is today a stylish boutique spa hotel with exquisite event space. With its splendid gardens and facilities, weary travelers are invited to relax, rejuvenate, and reconnect with nature. Learn more about the History of Hacienda La Magdalena .